I’ve already reviewed the core here. I really think Themefuse did a great job on that theme. The Core is an all in one theme with loads of demos you can import easily and Gourmet is just one of the many sites you can import which means you get great value for money here. Gourmet doesn’t feel like a demo for a wider theme. It feels like a fully featured, perfectly executed WordPress theme. With lots of other ‘all in one’ themes the main demo tends to stand out but some of the other demos feel rushed and generic. There have been no corners cut in the design of Gourmet at all and it really shows just how effective the overall framework is. As soon as you look at Gourmet, the design quality is obvious. Themefuse have chosen the typography and imagery very well. Plenty of white space has been used which gives the content room to breathe and makes it easy to read. There is also plenty of variety in the layouts and the subtle animations work really well. The menu page is very clear and well designed. Users wont have any issues scanning though your menu items here. Each section is broken up with a nice big full width image which does a great job of showing off the delicious food and drink on offer. All the other internal pages look good too an you’ll have almost everything you need to set up a very effective website for any restaurant or cafe. The one thing I would like to see added for any food establishment theme is some kind of reservation functionality. Themefuse are very experienced theme authors and the quality of their themes is always high. They provide plenty of updates and their products are trusted by thousands of users. As Gourmet is part of a large, all in one theme you’ll get tons of features, probably far more than you’ll need for a single restaurant website. These features will include Unyson – a framework with a page builder, SEO features, sliders, social integration and much more. You’ll also have color options and different layout options for the header and footer. There is also a powerful font customization feature which allows you to choose between and preview lots of Google Fonts. 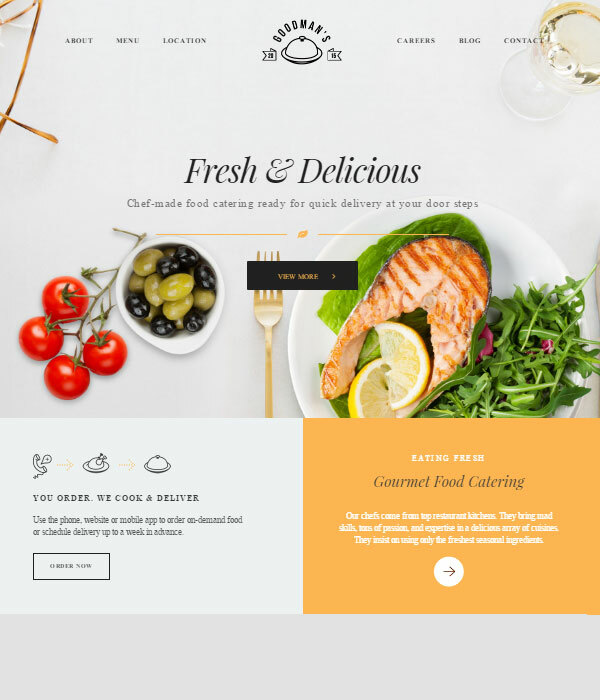 A great theme for a wide range of food based websites built on top of a reliable and popular framework. This is a great theme and you should definitely check it out. Themefuse have a ‘test labs’ feature which allow you to try their themes for free so head over there now and give Gourmet a try.